Download "3 IN 1 BATHROOM HEATER"
1 3 IN 1 BATHROOM HEATER MODEL NO. 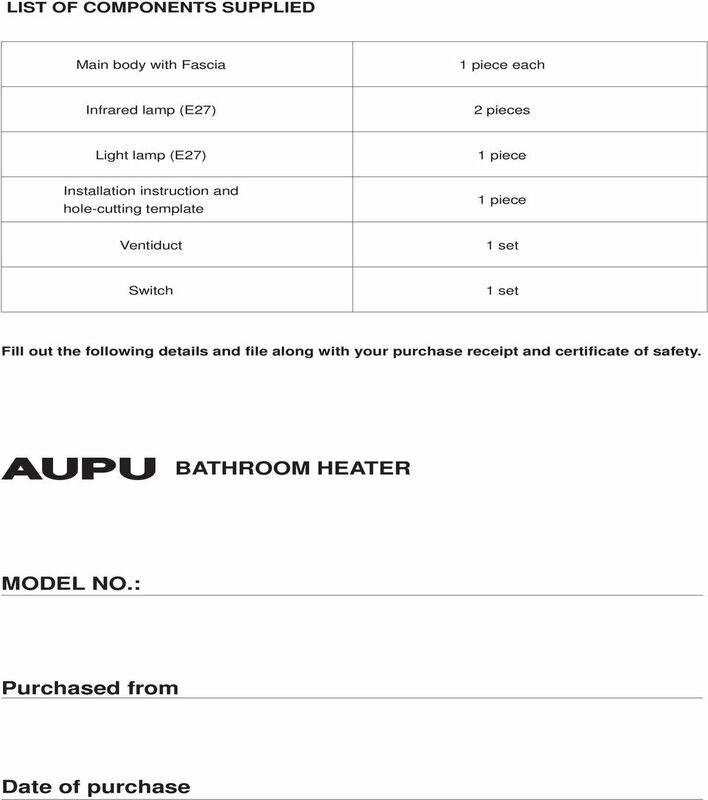 : A515 - SH MINI FUNCTION: HEATER, EXHAUST FAN AND LIGHT Dear customers, Thank you for selecting the AUPU 3 in 1 Bathroom Heater. Please read all instructions before commencing installation. 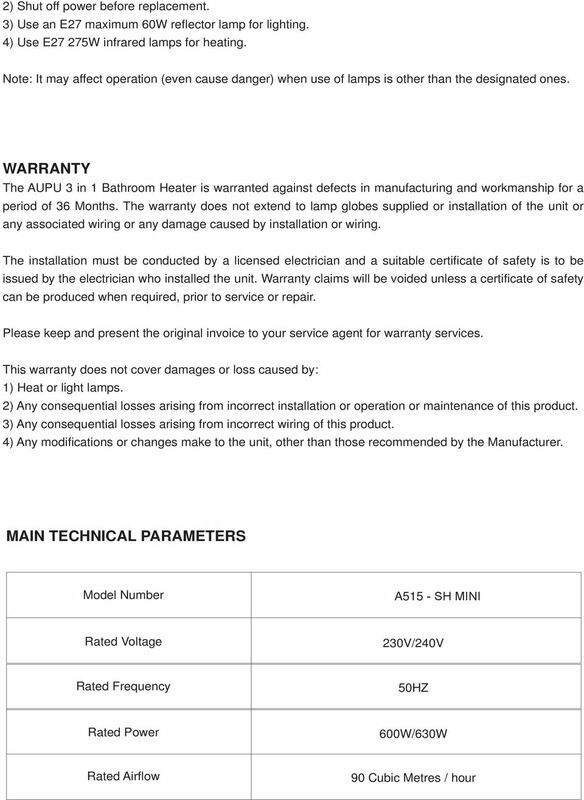 IMPORTANT: The AUPU 3 in 1 Bathroom Heater must be installed to comply with the appropriate council regulations and the local wiring rules or latest edition thereof. A licensed Electrician is required to connect this unit to the mains supply. The main supply and interconnecting cables required for installation of this appliance are not included, suitable cabling no lighter than ordinary duty cable rated at a minimum 10 Amp load rating is to be used when installing / wiring this appliance. WARNING 1.Use this heater only as described in this manual. Any other use not recommended by the manufacturer may cause fire, electric shock, or injury to persons. If you have questions, contact the manufacture or local agent. 2. All wiring must be carried out by a Licensed Electrician in accordance with all applicable National / local codes and standards. Also check with the local council regulations regarding installation of exhaust fans. 3. Make sure the power is off before the installation. 4. When cutting into the wall, do not damage electrical wiring and other hidden utilities. 5.The heater must be properly grounded. 6.The lamps are hot when in use. Do not touch the infrared lamps with any part of your body when in use. Allow all lamps to cool sufficiently before touching or replacement. 7.For the purpose of avoiding any dangerous gas leaking into your bathroom, the ventiduct of the heater must not be laid together with the ventiduct of air-fueled water heater or other open-fire appliances into the same flue. 8. The heater must be isolated from the power by means of a plug or all-pole disconnection switch with a contact separation of at least 3mm in each pole. 9. The power cable must stand a minimum 5A load. IMPORTANT CONSIDERATIONS BEFORE INSTALLING A few minutes planning can make a big difference to the installation time and also to your satisfaction with the function of the unit. 1. The unit should not be installed directly above shower or bathtub. The unit must not be installed in a position where water may splash onto the lamps. 3 Remove all lamps from the unit. Unclip the internal fascia-retaining springs inside the housing. Remove the fascia. Be careful not to damage the lamps when removing, storing or replacing. Remove the fan outlet from housing. 6.Wiring (Ensure that the power is turned off before carrying out any work on electrical installations) Using suitable cable/s wire the 4 gang wall mounted switch with the active line via a suitable isolating switch or power outlet, as shown below, run the cable through the wall cavity to the for connection to the bathroom heater lamp. 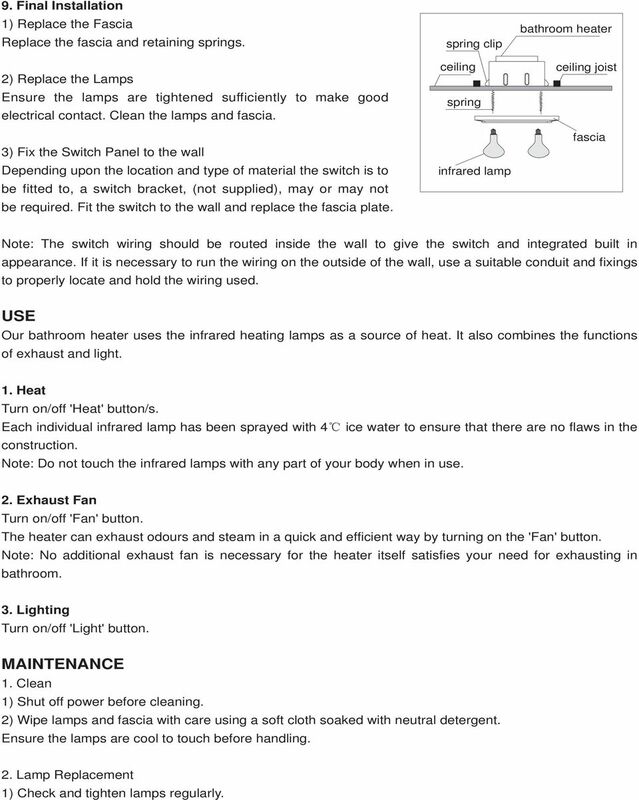 Connect the wiring to the terminal block in the bathroom heater lamp, as per the wiring diagram below, run the neutral line to the bathroom heater unit neutral connection via the isolating switch or power outlet as used for the active line. Connect and ensure that the earth connections on the unit are properly grounded. Once the wiring is connected, replace the terminal cover on the bathroom heater lamp unit and locate the cabling so as to allow room for the bathroom heater lamp unit to be positioned in the cavity. P 7. Fit the in-house end of the duct to the fan outlet, and fix the end with duct clip. Note: Keep the route as straight as possible. 8. Position the housing into the hole Choose an optimal direction to put the housing into the hole in accordance with the position of fan outlet. Use the two spring clips to fix the housing. Push the body of the unit into the hole in the, duct side first, pull the spring clips inward to avoid damage to the, then release so the spring clips can grip. Ensure that the unit is held securely by the clips. If required, screws may be used to aid holding the unit in the. Some screw holes are provided in the housing for this purpose. cable fan outlet Note: Try to keep the redundant wire away from the housing. 4 9. Final Installation 1) Replace the Fascia Replace the fascia and retaining springs. 2) Replace the Lamps Ensure the lamps are tightened sufficiently to make good electrical contact. Clean the lamps and fascia. 3) Fix the Switch Panel to the wall Depending upon the location and type of material the switch is to be fitted to, a switch bracket, (not supplied), may or may not be required. Fit the switch to the wall and replace the fascia plate. spring clip spring infrared lamp bathroom heater joist fascia Note: The switch wiring should be routed inside the wall to give the switch and integrated built in appearance. If it is necessary to run the wiring on the outside of the wall, use a suitable conduit and fixings to properly locate and hold the wiring used. USE Our bathroom heater uses the infrared heating lamps as a source of heat. It also combines the functions of exhaust and light. 1. Heat Turn on/off 'Heat' button/s. Each individual infrared lamp has been sprayed with 4 ice water to ensure that there are no flaws in the construction. Note: Do not touch the infrared lamps with any part of your body when in use. 2. Exhaust Fan Turn on/off 'Fan' button. The heater can exhaust odours and steam in a quick and efficient way by turning on the 'Fan' button. Note: No additional exhaust fan is necessary for the heater itself satisfies your need for exhausting in bathroom. 3. Lighting Turn on/off 'Light' button. MAINTENANCE 1. Clean 1) Shut off power before cleaning. 2) Wipe lamps and fascia with care using a soft cloth soaked with neutral detergent. Ensure the lamps are cool to touch before handling. 2. Lamp Replacement 1) Check and tighten lamps regularly. DC Heat Recovery Unit MVHR Wholehouse heat recovery unit Stock Ref. 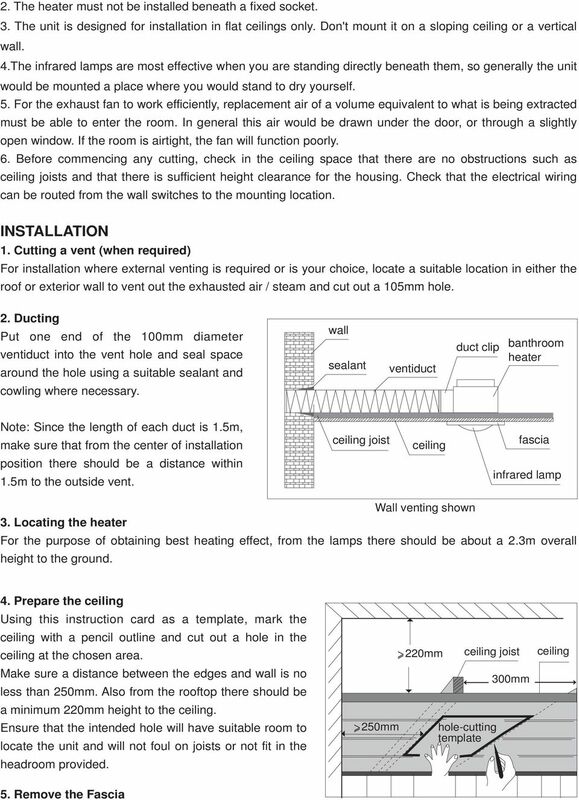 N DC Heat Recovery Unit MVHR 443423 Installation, Maintenance & Users Instructions PLEASE READ INSTRUCTIONS IN CONJUNCTION WITH ILLUSTRATIONS. 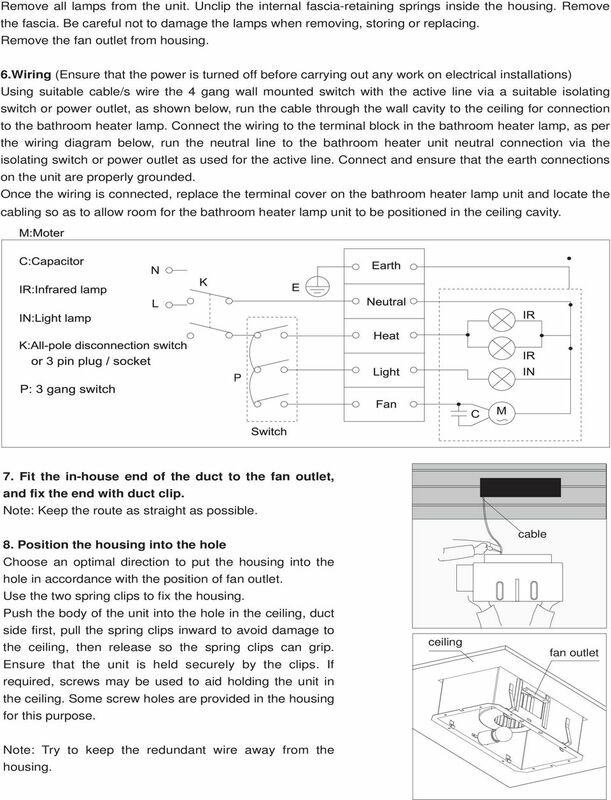 SEIH5KP1, SEIH6KP1 Installation Manual. Issue STROM- ELECTRICAL. Do not extend the hot water outlet tube. Minimum working pressure: 220kPa (system might not work properly if the pressure is below the requirement). OPERATION MANUAL. IC-18A INDUCTION COOKER 120V, 60Hz, 1.8KW IC-22A INDUCTION COOKER 208V, 60Hz, 2.2KW IC-25A INDUCTION COOKER 240V, 60Hz, 2. IceProbe Thermoelectric Aquarium Chiller Model IPAC-50W Instructions & Warranty (For U.S.A. Only) 1 Safety Precautions To operate your CoolWorks IceProbe Aquarium Chiller: 1. Read all instructions. 2. Instructions. Cleaning Clean the housing regularly with a soft cloth, preferably after each use. Cod. 252.155.10 CUCINE CON PIANO IN VETROCERAMICA COOKERS WITH PYROCERAM TOPS MOD. 60/30 PVE MOD. 60/60 PVE MOD. 60/30 PVE MOD. Due to continual improvement in design or otherwise, the product you purchase may differ slightly from the illustration in this book. NEMCO 2-SHELF MERCHANDISER MODEL SERIES: 6480-18, 6480-24, 6480-30, 6480-36 OPERATING INSTRUCTIONS INTRODUCTION 1. 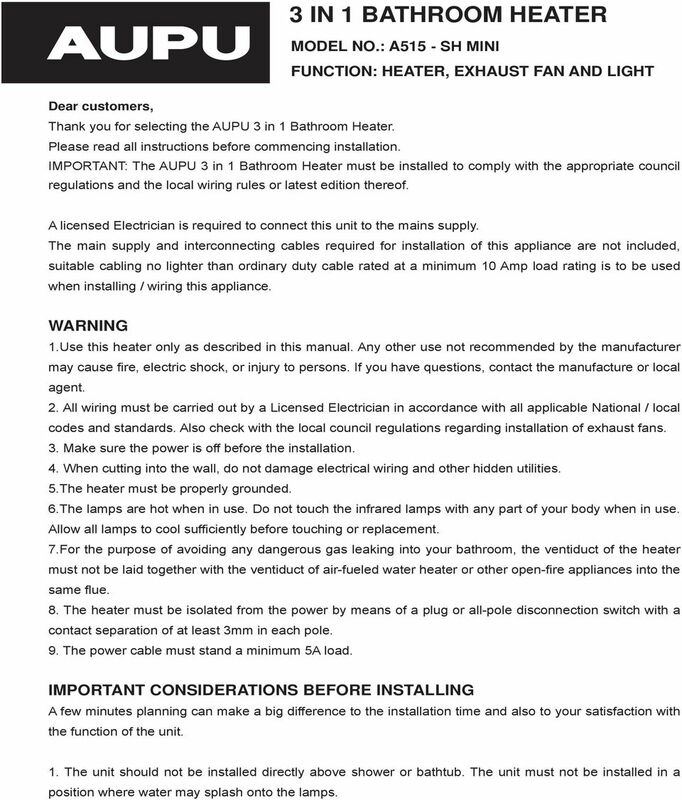 Read These Operating Instructions thoroughly before installing or using this Equipment. Pet hair clipper. Model 96822. Diagrams within this manual may not be drawn proportionally.